Chances are you already have a Mobile data System that works for you. Using our FACTSMobile™ technology will guarantee that you can continue to do so. FACTSMobile™ is a non-proprietary mobile messaging component required to interface FACTS™ to 3rd party wireless providers and networks. This permits CLI to work with any mobile device or wireless vendor of your choice. However, knowing that technology is changing constantly, Carrier Logistics also offers several mobile data communications options to better suite your current and future needs. From simple text messaging to bar code scanning and signature capture, our partnerships with best of breed mobile technology providers will ensure you deploy only the finest mobile fleet technology available in the industry today. Being non-proprietary, FACTSMobile™allows us to work with most mobile vendors. FACTSMobile™ permits the use of all current and future mobile technologies. Pickup and Delivery information can be pushed down to the device automatically. Real-time mobile updates will ensure that all stop and shipment details are available immediately. Details can include account and billing info, signature capture, photos and bar code scanning. FACTSMobile™ can be added at anytime as it is not a prerequisite to deploy with our dispatch systems. In the market for a new solution? CLI, along with our partner Acordex Software, now offers mobile communications to connect your Dispatch operation to a wireless provider and smart phone or tablet of your choice! FACTSMobileExpress™ is built on the latest in smart phone technology. Once installed, pickup and delivery information can be communicated to and from drivers automatically from most of todays popular trucking software packages. FACTSMobileExpress™ extracts data from your Transportation Management Software (TMS) and places up-to-the-minute information about every stop literally in the hands of your drivers. This eliminates misunderstandings about routing & scheduling and in a business where margins are razor thin, reducing costs even a few percentage points can make a huge difference. Already have a Mobile Solution? Then look at FACTSMobile™. 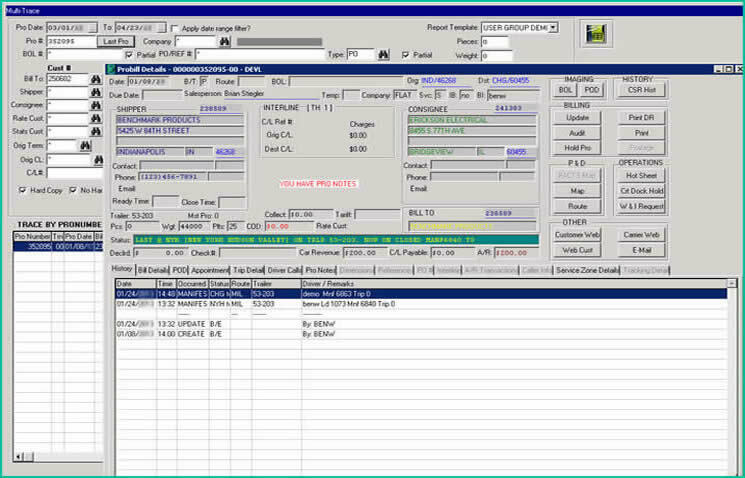 The same software used in conjunction with FACTSMobileExpress™ can be programmed to allow you to interface your dispatch software to other 3rd party wireless providers and networks of your choice. Our non-proprietary mobile messaging component will ensure your complete independence as FACTSMobile™ is designed to run agonistically on most hardware and data networks. From simple text messaging to bar code scanning and signature capture, our partnerships with best of breed mobile technology providers will bring you only the finest mobile fleet technology available in the industry today. Get more information about FACTSMobile™ and its mobile dispatching technology or transportation solutions by connecting with a CLI representative here, or send an email to sales@carrierlogistics.com.